It’s that time of week of again – The Grand Tour time. If you happen to be wondering what happened to my review of episode 10, well to be honest, I didn’t get around to writing, and when I did, it didn’t seem worth it. Anyway, on to business, and episode 11. It’s said that season 4 of The Grand Tour will be made up of specials as opposed to the format we’ve become accustomed to – I.E. the big green tent. Season 3 has certainly hinted at that as we’ve had the so-so Colombia special, the thoroughly entertaining RV special and tonight’s offering, which Clarkson described as a “mini-special”. I’m not too sure why, as there were no Minis involved, nor was the special any smaller than TGT’s other specials. Clarkson then goes on to ask what if you lived on the coast of Georgia, but you want to go all the way of the coast of Azerbaijan to get a nice bit of bream. Yes, even for TGT standards, this sounds like a very tenuous set up for a special. Thankfully, the film itself was much less tenuous. For that distance of driving (around 1000km) the trio decide that what they really need, are grand tourers. 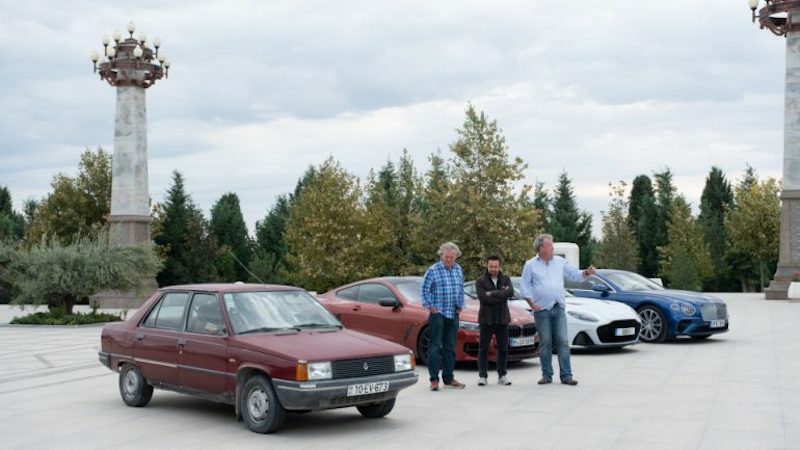 After some beautiful shots of Batumi, Georgia we join Clarkson, Hammond and May in their respective cars; the Aston Martin DBS, the Bentley Continental GT and the BMW M850i. After the trio bicker and mock each others’ choices of cars – a bit I always enjoy – they hit the Georgian roads in their bid to prove who has the best car. Not too long after they do so, Clarkson questions whether or not the DBS is worth the extra £67,000, before ripping in to the car’s interior for not feeling special enough. On the plus side, it’s the fastest and lightest car out of the three as Clarkson points out. Hammond then pipes in, claiming that the Continental GT is the perfect car for the job as Bentley has a long history for making the grand tourer, and to be fair, he makes a good point. However, May calls the heritage of both the Continental GT and the DBS “nonsense”, given the fact both cars have German components. May describes his BMW as a “proper car, and not tinsel”. Steady on, Captain Slow! After the trio make a good case for each of their cars, they stop off at the house where Soviet dictator Joseph Stalin grew up, much to annoyance of Hammond. Clarkson and May, however, discuss the fearsome ruler in greater length, but that gets interrupted as May breaks an item in the historic home. That evening he and Clarkson set out to ‘take down’ the statue and the result of their hard work is a wonderful new bonnet ornament for Hammond’s Bentley. Ok, so this was obviously a staged gag, and a very silly one at that, but it did make me chuckle. I wouldn’t say it was their greatest ever joke, though. 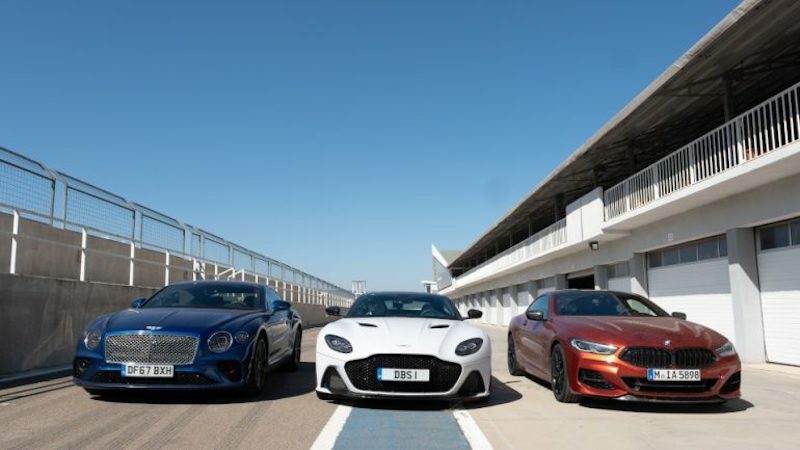 After munching up some more miles in their big, expensive cars, the GT boys find themselves at a racetrack, giving them the chance to let their cars really stretch their legs. The DBS has the advantage here of course, as it has the most power, and it’s the most track focused car out of the three. So it comes as no surprise that the DBS was the fastest car around the circuit, despite Clarkson’s sideways action that made for some cracking shots by the TG production crew. This wasn’t enough for Mr Wilman, though, as he set the three a rather unusual challenge. He wants to see whether CHM can drive any faster if they hit the track with their bladders fit to burst. So, the trio drink three pints of water, wait 20 minutes and then pound the track’s tarmac anymore to see if the need for a “waz”, as May elegantly put it, would make them any quicker. Following the track antics, the trio see how much they can fit in their boots, grand tourers need to be practical after all. Clarkson, Hammond and May sniff out the nearest flea market to see what they can buy to stuff in to their boots. Hammond goes for two big jugs, a guitar and a Russian clock, Clarkson has eyes bigger than his boot as his buys a trombone that’s too big, and May? He ends up with said trombone, which is added to a stuffed porcupine, an old record player amongst other things.This all made for a rather entertaining scene full of the sort of lad’s banter and innuendo you would expect from Clarkson, Hammond and May. The trio arrive in a town called Ganja in Azerbaijan, which, it has to be said, has got some fantastic architecture, as Jezza points out in the film. James May then ruins the mood somewhat by declaring that they don’t really need fast cars for the trip as they are no quicker in the real word. Despite a large dose of skepticism from Clarkson, I can see where May is coming from. This week I’ve been testing the Honda Civic Type R, which is insanely fast for a hatchback, but is it really any faster than any other car on my daily commute? No, because as May points out, there are traffic lights, speed cameras, and general traffic. To really hammer his point home, he invites Abbie Eaton to join them in a Renault 19 that looks ready to be handed over the nearest scrapyard. With a two minute head start, Abbie sets out to prove that she will be quicker in the old French banger than the plush grand tourers driven by CHM. This makes for an interesting and entertaining piece, although I don’t think it would have got glowing reviews from road safety organisations. Mind you, since when has The Grand Tour cared about health and safety. 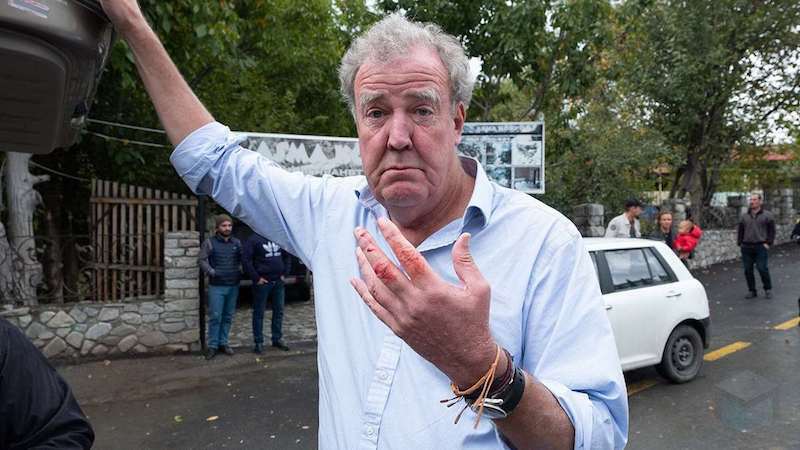 Speaking of health and safety, Clarkson could have come to a sticky end in the show’s climax. Thanks to the wonderful people of Baku, the GT boys are able to have a drag race on a strip of road that makes up the Azerbaijan grand prix circuit after the road is closed to the public. Clarkson is confident that his car will win given the fact he – well, his car – is the lightest and the fastest. This is a problem, however, he has to rely on rear wheel drive whilst his colleagues have the assured security of all wheel drive. This is made even worse by the fact that the road surface is as wet as a duck’s bum. The result? Well I won’t give away too much, but Clarkson covered more distance sideways than he did going forward. Not such a good idea after all, eh Clarkson? I didn’t really care too much for last week’s episode, which is strange as it featured hot hatches, of which I’m a massive fan of. This week’s show, however, despite it’s tenuous reason for filming, was an enjoyable one and a worthwhile watch.